The feeling of regret is a powerful one, keeping us up late at night racking our brains over what could have been if a different decision had been made. The longer this feeling goes on it can become more intense with the eternal question of "What if?" bouncing around our minds with increasing velocity. Imagine how my father might feel when, forty years later, he thinks he made the wrong choice. Now memory is a fickle thing, so my father can't quite remember the specifics of where, when (possibly 1974) or why (potentially a twenty first birthday), but a situation arose where a relative was going to buy him a watch and it came down to two choices: an Omega Constellation or a Rolex Explorer. Now for whatever reason, preference or budget, my father went with the Omega. This particular Constellation (reference 168.0044, in stainless steel on a leather strap) began production in 1968, making use of the new 1001 calibre movement that Omega had developed to succeed the very successful 500 series. The majority of classic Constellation Chronometers from the sixties, including the famous Pie Pan, used the 500 series and are considered by collectors to be one of the best mass produced Swiss Calibres ever made. The 1001 calibre however is not so highly regarded and was plagued with problems from the outset, with many having to be returned to Omega. This was especially disappointing for Omega as this movement was the first in a series of decisions to move towards focusing on more mass production. A 60's Constellation next to it's contemporary. I know which one I would rather have. Despite whatever regrets my father may have about the watch, I'm confident that he made the right decision. The Explorer had remained practically unchanged since its initial design in 1953, whereas this Constellation was a huge design change from the previous decade's iteration now with a thick cushion-shaped case and television shaped dial. There is just something cool about the design, something unquestionably funky that brings to mind wide collars and bell bottom jeans. In just a few years the Constellation would be changed again (in my opinion for the worse) to the "Manhattan" style as the quality of Swiss timepieces was to dramatically decrease during the "Quartz Crisis". To fully understand what the crisis (or revolution, depending on your perspective) would do to the Swiss industry, then we have to go back sixty years and across the Atlantic Ocean to Lancaster, Pennsylvania - to the Hamilton Watch Company. After ten years of development, in 1957 Hamilton announced the world's first electric watch, combining a traditional balance wheel with an electric circuit. Despite being destined to become obsolete in a matter of years, the technology was truly incredible and truly beautiful. On its rotation, a magnetic coil attached to the balance wheel passes over a magnetic field underneath which briefly completes the electrical circuit, triggering an impulse. This impulse is passed back through the balance wheel creating the energy required to make the rotation. At the moment of inertia, the spring coils up providing the energy to return to its original position, for the cycle to complete again. Despite the high levels of accuracy compared to mechanical watches, the Hamilton was plagued with problems. The circuit contacts would wear out very quickly and were prone to breaking. It took two years for Hamilton to release the more reliable 505 calibre in 1959 but it was too little too late as just one year later, the new king of electric watches was to be released just a few miles north in New York (care of Geneva). Again with ten years of development, Bulova released the Accutron as the world's first fully electronic watch, which single-handedly eclipsed Hamilton's effort altogether. 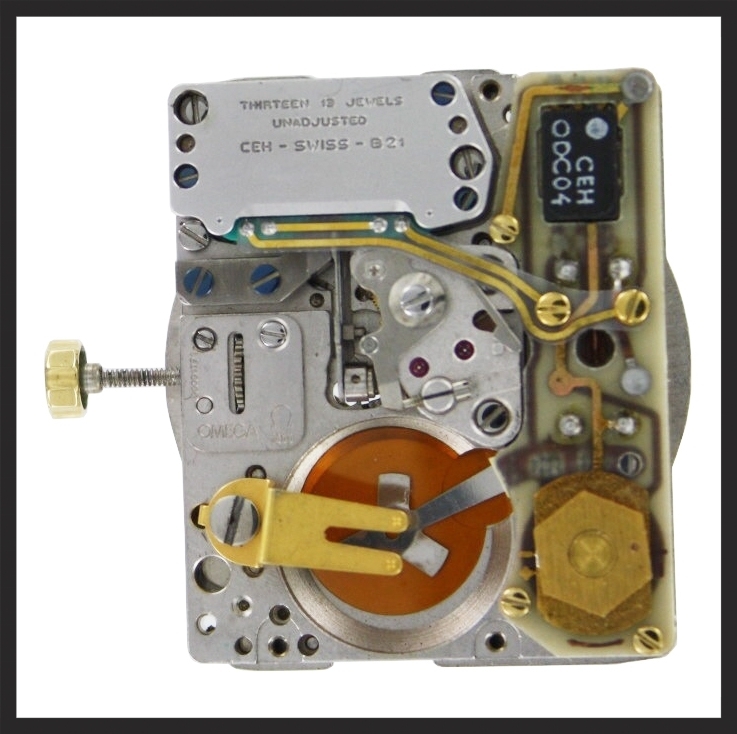 Rather than trying to combine a delicate hairspring and balance wheel with circuitry, the Accutron simply replaced it with a tuning fork that oscillated at 360hz when a current was passed through it. Through the tuning fork, this current is passed to two "index fingers" which provide energy onto the gear train starting with a gear with over 300 miniature impossible to see teeth. As the index fingers drives the gear train, rather than the gear train providing energy to a balance wheel, the flow of energy was more direct and required less lubrication which meant a more consistent and reliable performance. Bulova was not afraid of saying so, "It makes the finest watches - even electric watches- obsolete" was a tagline from the Bulova Accutron Spaceview advertisement, a direct attack on Hamilton and all Swiss watches. Looking back at Bulova's print advertisements, I would have loved to be a fly on the wall at Hamilton as they watches their product get lambasted across print media. However history does repeat itself and nine years later, a death knell would ring out marking the beginning of the end for tuning fork watches and the golden age of Swiss mechanical watches. 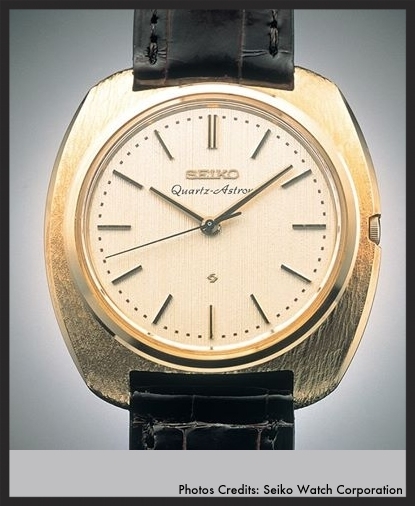 The Seiko Astron, the world's first quartz wristwatch. Photo credit Nihon Watches. 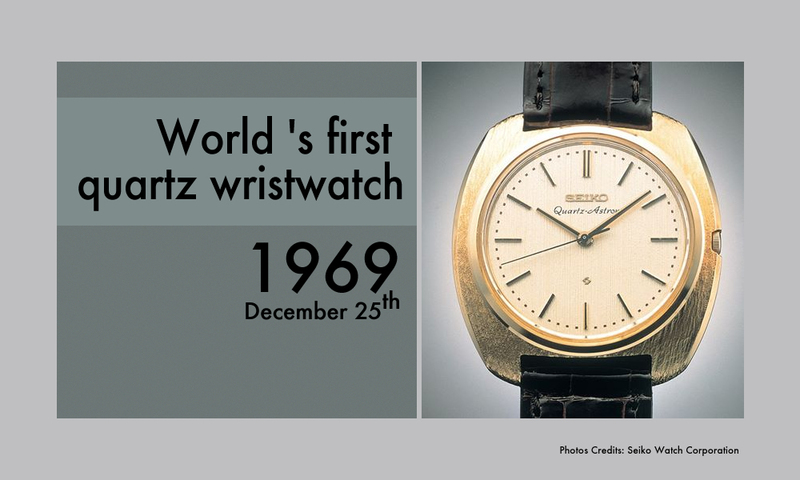 On Christmas Day 1969 in Toyko, Seiko released the world's first quartz powered wristwatch, the Seiko 35SQ Astron which priced at 450,000 Yen (Over eight thousand times the average monthly wage at the time) and made in solid 18 karat gold was definitely placed in the luxury category. Whilst initially similar, a quartz circuit is vastly superior to a tuning fork in terms of accuracy. An electric current is provided from a battery runs into a microchip circuit with a quartz crystal oscillating at a very high frequency (the industry standard now is 32,768 times but in the Seiko 8,192). The circuit counts the oscillations and turns them into regular seconds. These watches were incredibly accurate for the day and really made the wealthy question why would they want an "old fashioned" mechanical watch requiring winding whereas this new Seiko could run for an entire year without input and be within five seconds a month. Responding to the Japanese, a collection of twenty Swiss manufactures collaborated to create a Swiss made electric movement which would eventually would be known as the Beta-21 movement. Effectively a Swiss tuning fork movement, Omega was the first to release a watch featuring the Beta-21, calling it "Electroquartz", with Rolex releasing the 5100 and Patek Philippe the 3587 (recently featured on an episode of Hodinkee's Talking Watches). However the Swiss had been far too slow to react to the changing technology as the Beta-21 was really over designed, over engineered and had taken too long to get to the market as soon cheap and reliable quartz movements were being produced by Seiko making the tuning fork obsolete. Omega continued to release different variations of the movement for a number of years hoping the moniker "Swiss Made" would bring in consumers however it was just a matter of time before the Swiss had to admit defeat and focus on quartz. By this time though, the difference in quality between a Swiss/Japanese quartz couldn't compensate for the difference in price and soon production of mechanical watches diminished from 40 million in 1973 to 3 million ten years later. Twenty Swiss watch companies later and this was the result, the Beta-21. Omega's first electric wristwatch, the Electroquartz. Probably the most refined out of all the Beta 21's, the Rolex 5100 Oysterquartz. A very classic look from Piaget for their first quartz watch. 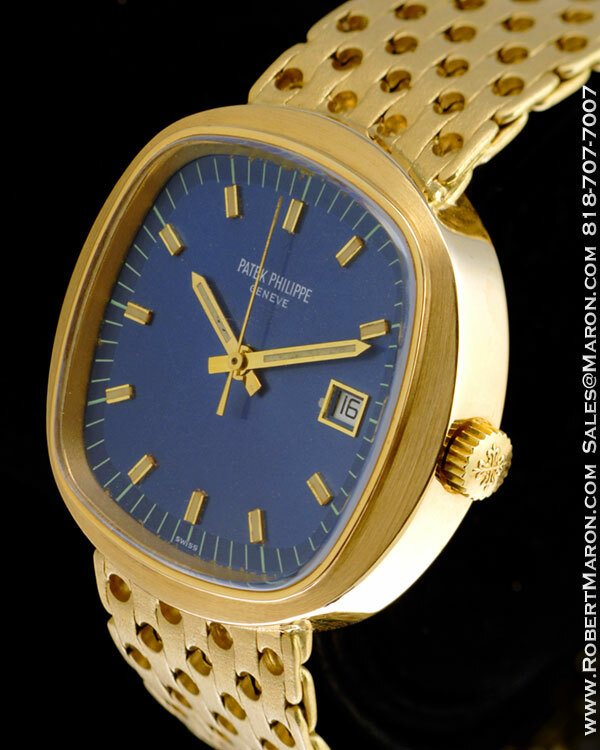 A solid 18ct yellow gold Patek Phillippe. The revival of Swiss watches led by Mr Nicholas Hayek Sr is one that deserves to be looked at in more detail but briefly thanks to the emergence of the Swatch watch and Mr Hayek's acumen, the Swiss Industry was able to get up off the ground and start producing again. In hindsight, it is rather a tragic story that these companies collaborated on something that they thought would save their industry yet the quartz movement almost destroyed it. What makes Swiss mechanical movements superior to their Japanese counterparts is the heritage and craftsmanship that should be present in the design and production of each piece. By cheapening their own history and their watches it led them down a road that would lead them to the edge of creative and literal bankruptcy. It would be interesting to know what the brands think of those Beta 21 pieces now; do they look back in regret or do they appreciate their history regardless knowing that decisions made then have brought about the market you see today where you can have a trade show celebrating the craftsmanship and beautiful pointlessness of mechanical watches in an age of quartz. Now I don't know the history of my father's watch after he bought it in 1974. I don't know how often he wore it or whether he ended up buying a Swiss quartz piece eventually. As a youth I remember him wearing it and of course being a teenager assessing my father's choice of style I thought it was terribly uncool, now thankfully I've managed to refine my taste a lot more. It definitely shows it's age with scratches across the case and a slightly capricious crown that feels like it's either welding into the case or liable to come apart at any time. Over time the dial has developed this gorgeous patina creating a bluey black colour that changes in the light; where you can almost see the cracks that have formed over time. Rather much like it's owner really.